Media in Pakistan continued to operate under increasingly threatening and insecure conditions in 2014 with the year emerging as the bloodiest for journalists in the country’s history. Ten journalists, four media assistants and one blogger were killed in 2014 and scores others, including female journalists, routinely threatened, intimidated and harassed all over the country amid thinly veiled attempts by several quarters top browbeat the media into silence. The otherwise generally safer Punjab caught up with violent Balochistan – four scribes were killed in each of these two provinces – while two were murdered in Khyber Pakhtunkhwa and one in Sindh. 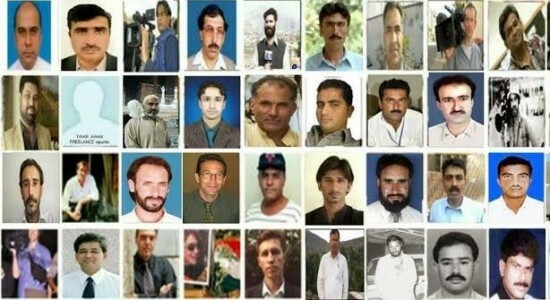 No journalist was killed in violent Federally Administered Tribal Areas (FATA) although the region remained hostile and unsympathetic for journalists where they were intimidated by both state and non-state actors in 2014. Some murder attacks clearly relate to the professional work of these slain journalists while some warrant in-depth investigations to establish whether the motive for attacks on them was other than their profession. Among those who were not killed, a record documented number of journalists – 58 – were intensely threatened, intimidated and harassed. The forces involved in these actions included, as documented and outlined by the journalists, the state, political parties, banned militant groups, terrorists groups like Taliban, and insurgent groups. Among the threatened, intimidated and harassed journalists included six female reporters and newscasters too in 2014. The number may be higher than what has been recorded as there is no centralized monitoring mechanism at the government level nor are journalists adequately trained to document each threat they receive. A key, and troubling, trend on the issue of impunity – freedom from punishment for attackers – in 2014 was that the enemies of free press got not just stronger in Pakistan but no longer remained unknown. Some of them did not hide their faces and went online to take responsibility for one attack or another on media house and journalists busy for investigating various acts of omission or commission by both state and non-state actors. It is clear that in Pakistan media houses and journalists trying to report on grey areas of the security and political realms are under attack. None of this is exemplified better than the fact that Pakistan is the only country where a journalist – Hamid Mir – practices journalism with two bullets in his body. He was attacked on April 19, 2014, and shot six times. His family blamed the country’s premier intelligence agency ISI as being “behind the attack.” Mir, and his employer Geo News TV channel, spent the most of the year trying to recover from disproportionately high punitive action from the security establishment for being named as the attacker. By the end of 2014, Mir was back at his job with two of the six bullets still lodged in his body. While his attackers haven’t been traced, indicted, convicted or punished, Mir’s tenacity in going back to duty in the face of continuing impunity for his attackers also exemplifies the courage of Pakistani journalists. Another high-profile case of an attack on a journalist was writer and TV talk show anchor Raza Rumi who was confronted for his views on minority rights and for challenging groups involved in sectarian violence in the country. He survived an assassination attempt in Lahore, provincial capital of Punjab province. While he survived, his driver was killed. “Extremists want no counter narrative in the state that is why they are attacking alternative voices,” Rumi told AFP after the attack. Express News TV channel was targeted more than one occasion for taking up minority communities’ plight. The persistent attacks aimed to force a change in the channel’s editorial policy towards the same issue, as revealed in detail by former employee Neha Ansari in an article in Foreign Policy magazine. Enforced censorship was a new dimension to the pattern of attacks on free press in Pakistan in 2014 besides proactive self-censorship by journalists and media houses to stay safe in the face of unabated and unchallenged multiple attacks against media. After aggressively being denied distribution through cable network in most parts of the country with support of the security establishment, Geo News managed to stage a comeback in late 2014 but continued to be put off the cable network in the country’s cantonment areas where the Jang Group’s English and Urdu publications were also banned after the allegation that ISI chief was behind the attack on Mir. Some other TV channels, such as ARY News, were also taken off cable network and newspaper deliveries were disrupted in several parts of the country to measures of dictating terms and change in news agendas. The media scene in Balochistan did not change for the better in 2014 and continued in the vein of the past several years where journalists have been hounded by both state and non-state actors, finding themselves caught in the middle of an insurgency that has proven dangerous for them to report. This despite the provincial government’s expression of solidarity with media after three journalists and a media assistant were gunned down in the province in 2014. The killing of young Irshad Mastoi right in his office chair in Quetta was a chilling reminder that the enemies of free press continue to act with impunity. Dera Bugti-based Baloch journalist Manzoor Bugti, working for Pakistan Television, remained unaccounted for since he disappeared in Quetta on November 7, 2014. The region of FATA was quieter in 2014 in terms of fatal casualties for media despite an escalation of hostilities between the security establishment and terror groups. The fact is that conditions to practice journalism in this region remain extremely challenging. Journalists are routinely restricted from movement in large swathes of the tribal areas. Embedded journalism seems to be the dominant form of journalism with the military’s public affairs wing – ISPR – now and then airlifting hand-picked mediapersons for access to restricted areas for selective coverage of military operations. Since the attack on Hamid Mir, journalists working with Geo News or Jang Group publications are routinely kept out of any official briefing on military operations or arranged trip to tribal areas. Any state promises of assistance with combating impunity against journalists remain mere lip service. A three-member judicial commission comprising judges of apex court has been meeting since the government announced its setting up on April 20, 2014, to probe the attack on Mir. The commission was mandated to submit its report within three weeks. However, it was given additional periods to complete the probe. But the probe is taking longer than expected time and the journalist community is becoming impatient to read the findings. By the end of 2014 there were no indications the report would be made public. Growing intolerance for a critical media was an added worry for journalists. Pakistan Tehreek-e-Insaf leader Imran Khan used public meetings to launch repeated tirades against Jang Group and its owner, prompting party supporters and activists to target journalists working with the group. Khan’s party cadres repeatedly attacked and thrashed several of its journalists including some female journalists. Self-exiled politico Altaf Hussain of Muttahida Qaumi Movement also used public meeting to demand that TV channels should air his telephonic addresses live to his supporters. Blogger Ali Raza Khawaja’s murder remains a mystery. He was shot dead in Karachi where attacks are so sophisticated one may not reach a conclusion to point an accusing finger at any group or individual for press freedom violations. The biggest challenge for media in Pakistan in 2015 will be to forge a consensus between the government and the media sector on a roadmap for media safety to engender a safer environment for journalism by arresting the tide of over 100 journalists killed in the country over the last decade. This can only be demonstrated through the establishment of a credible and effective mechanism, in tandem with the government, to combat impunity. This will entail measures ranging from drafting and passing special laws on media safety at the federal and provincial levels, as well as appointment of special prosecutors at the federal and provincial levels to investigate attacks against journalists and media as and when they happen. Another challenge will be creating a commission to restore confidence in the state’s ability to provide justice to the families, colleagues and media houses of over 100 journalists killed so far by tracing, indicting, convicting and punishing their killers, as well as providing legal and medical assistance, to journalists attacked. The government of Prime Minister Nawaz Sharif in 2014 made several promises and took some small measures to combat impunity against journalists and intimidation of media by various quarters but nothing concrete came out of it. In 2015, it will have another opportunity to come good on its promises. Media stakeholders, including representatives of media owners, working journalists, and national and international media support organizations using the platform of Pakistan Coalition on Media Safety (PCOMS), will have to provide the requisite technical assistance to the government so that Pakistan can address the journalists’ safety and security issues and the implementation of the UN Plan of Action on Impunity and Issues of Safety of which Pakistan is one of five pilot countries where it is to be implemented.